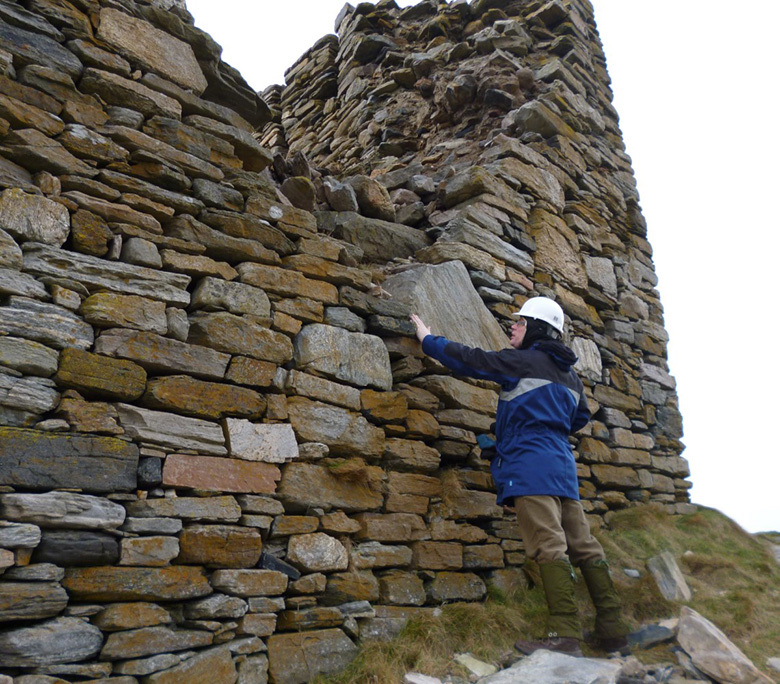 Senior Casework Officer Nicki Hall explores iconic Tongue landmark Caisteal Bharraich and the recent work carried out to preserve it for future generations. Have you ever stopped off on the North Coast 500 route and visited Tongue? If you do, you will discover more than just a pretty coastal village with spectacular scenery. In a dramatic hilltop position overlooking the Kyle of Tongue is Caisteal Bharraich. 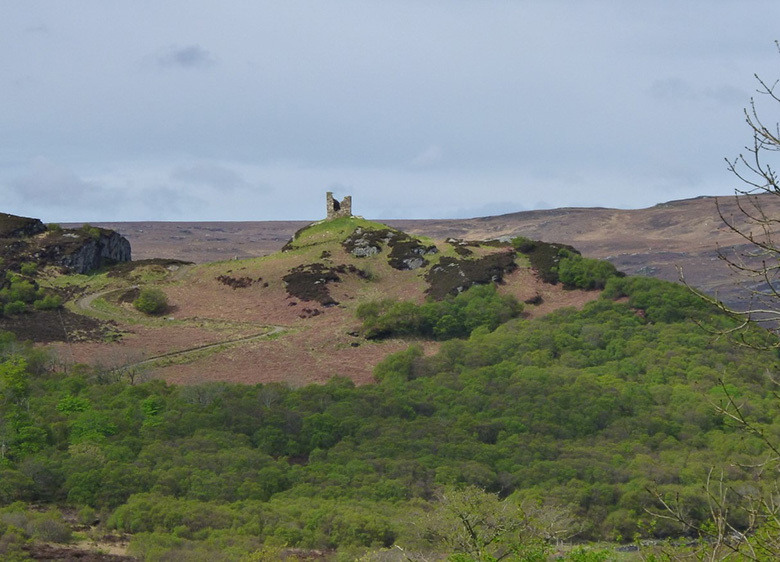 Much of the history of Caisteal Bharraich (or Castle Varrich) in Tongue is unknown. It does appear on some early maps of Scotland. 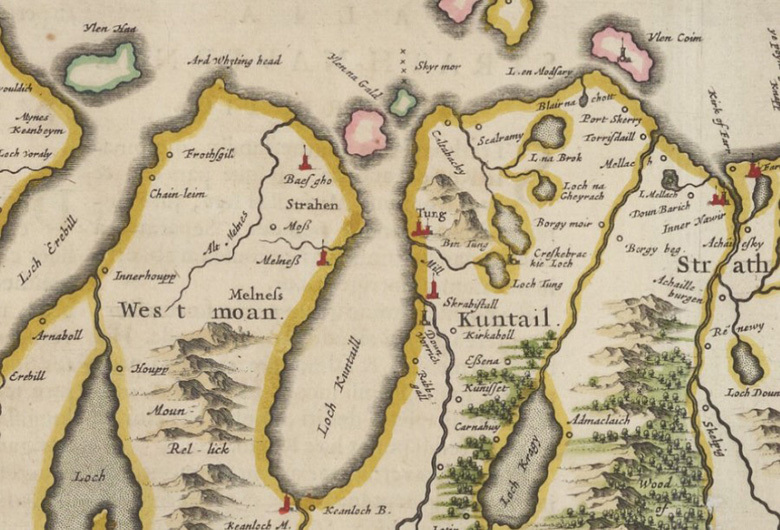 ‘Doun Vorrich’ is marked on Pont’s map of Strathnaver as a tower and it then appears on Blaeu’s map of the same area. The current tower house is probably a 16th-century reconstruction of an earlier tower. It was abandoned before the 18th-century. It is said to have belonged to the Bishop of Caithness who stayed here on his way from his castle at Scrabster to his property at Balnakiel. Caisteal Bharraich is also associated with 11th-century Norse occupation. The name ‘Tongue’ is said to come from the Norse ‘Tunga’ meaning land projecting into a loch. The castle has been identified as the seat of the Clan Mackay of Sutherland. The tower appears to have had two storeys, with the ground floor placed over sloping bedrock. There is an upper floor on a barrel vaulted arch and a timber roof. The exact function of the castle is unclear. Although modest in size, its elevated location on the summit of a promontory high above the Kyle of Tongue affords superb views in all directions. This adds weight to the suggestion that it was used as a lookout or beacon, or a defensive structure. The castle is also a highly visible feature within its landscape, so it would have been an attractive location for a high status dwelling such as the seat of the Clan Mackay. No doubt it will have been a landmark for passing ships. Today, this elevated position means that Caisteal Bharraich is an important Tongue landmark and is visible from the North Coast 500. Caisteal Bharraich is a scheduled monument – a legally protected site which is identified as being nationally important to Scotland. Currently, there are around 8000 of them. HES has a regulatory role in controlling works affecting scheduled monuments through Scheduled Monument Consent (SMC). This means that the castle has to be treated in a sensitive way, using appropriate conservation techniques and with archaeological input. Through our Historic Environment Repair Grant scheme, we grant-aided £70,000 to a project to repair the castle and build a new viewing platform. The castle had been deteriorating for a number of years when we were alerted of a significant collapse of the east wall after a winter storm in 2015. Following this, we visited the site to assess the damage and made a number of recommendations in an advisory report. Thanks to the local community and the landowner, Wildland Limited, a consolidation scheme was developed. It involved structural engineers, conservation architects and archaeologists. 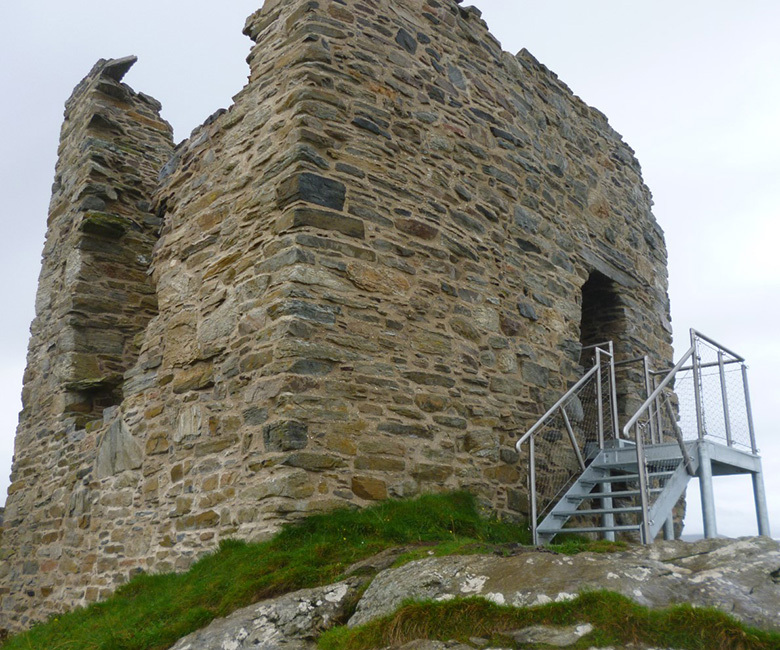 Plans included an innovative proposal to enhance access to the castle by installing a steel staircase. It was designed to be free standing so as not to interfere with the historic masonry. The new staircase enables visitors to appreciate the spectacular views from the castle’s upper levels. The castle and the staircase. During the construction of the staircase, animal bones, part of a rotary quern and a small worked bone object were recovered. These are thought to date to the post-abandonment of the site. 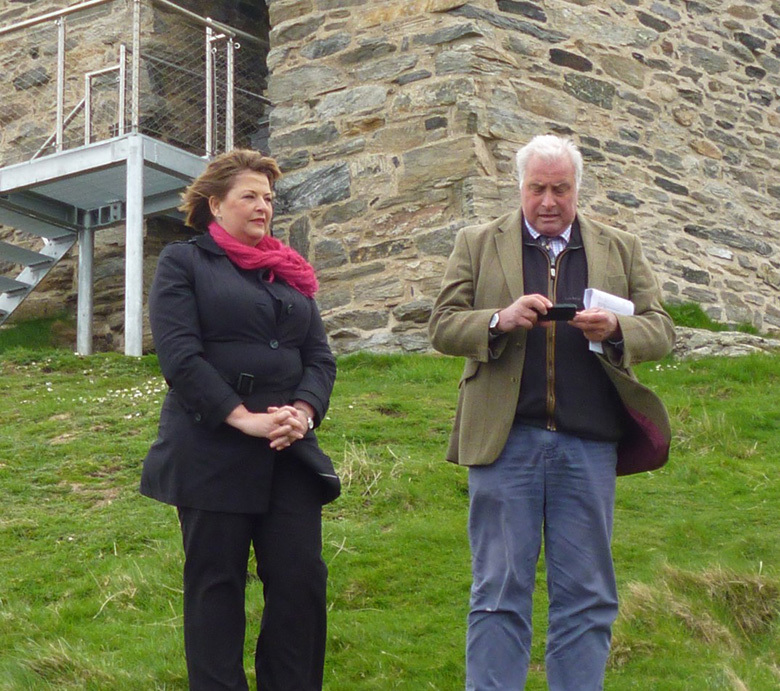 Cabinet Secretary for Culture, Tourism and External Affairs, Fiona Hyslop MSP opened the castle on 11 May 2018. 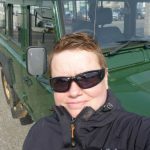 She commended the project partners and highlighted the opportunities afforded by the site as an important local landmark and boost for tourism along the North Coast 500 route. Tongue School pupils – who have Caisteal Bharraich featuring on their school uniform badge – played the bagpipes and sang local songs in English and Gaelic. The pupils have embedded a time capsule into the rebuilt section of the east wall. The capsule contains a variety of photos of artefacts from the school, drawings and letters relating to the local area, school life and the children’s predictions for the future. We are delighted that this nationally important site has been preserved for generations to come. The improved access to the castle also has wider public benefits. Whereas before, visitors could only access the ground level of the castle, they can now reach its upper levels and enjoy the spectacular views out over the surrounding landscape. The Caisteal Bharraich scheme was developed as part of the landowner’s Wildland project, extending across Ben Loyal and adjacent estates. The project was designed and overseen by Groves-Raines Architects with input from structural engineers David Narro Associates; the contractor G Brown Stonemason Limited and archaeologists CFA Archaeology. Morham & Brotchie Partnership and were the project Quantity Surveyors.